Maggie is funny and smart and LOVES candy–well, all food really, but especially candy. She fully intends to become President of the United States. She believes she has a plan for her life and does not intend to veer from–or be drawn off–it. Maggie’s eleventh year is the year she begins to suspect things in life can change in ways she does NOT anticipate. I’d always thought that all the answers to life’s questions were in books. I’d thought knowing where the sidewalk ended and where the red fern grew and where the wild things were could help me figure out LIFE. But maybe Dad was right. What if I needed to write my own story? Maggie’s father suffers from multiple sclerosis, although she can’t remember the actual name of his disease–just that it starts with an ‘M’ and that the only encyclopedia missing from their 1980’s household is the M volume. On her eleventh birthday Maggie’s parents call a family meeting to tell her and her two high school sisters that Mom is going back to work and Dad will now be at home with them. It is the first of many upheavals in Maggie’s life. Although her father’s limbs have always been “sleepy” Maggie figures things may have taken a turn for the worse if her parents are switching places in their daily routines. For her science fair project Maggie is determined to win the blue ribbon again by researching her father’s disease and finding a way to fix him. Without any previous actual knowledge about multiple sclerosis Maggie is surprised and confused to learn her father’s true prognosis. But now I knew it would never be over. Now I knew there was no way to fix Dad. Maggie is angry that her parents and older sisters have kept the truth of her father’s situation from her. And at the same time there is a part of her that wants to go back to not knowing. But once you have learned something, you can’t UN-know it. The Meaning of Maggie is tender and funny. 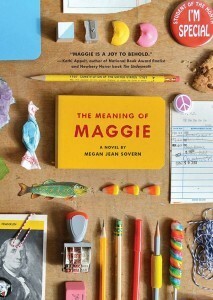 It is impossible not to like Maggie with her quirky eleven-year-old mix of know-it-all-ness and innocence as she hops back and forth between ridiculous and profound insights.